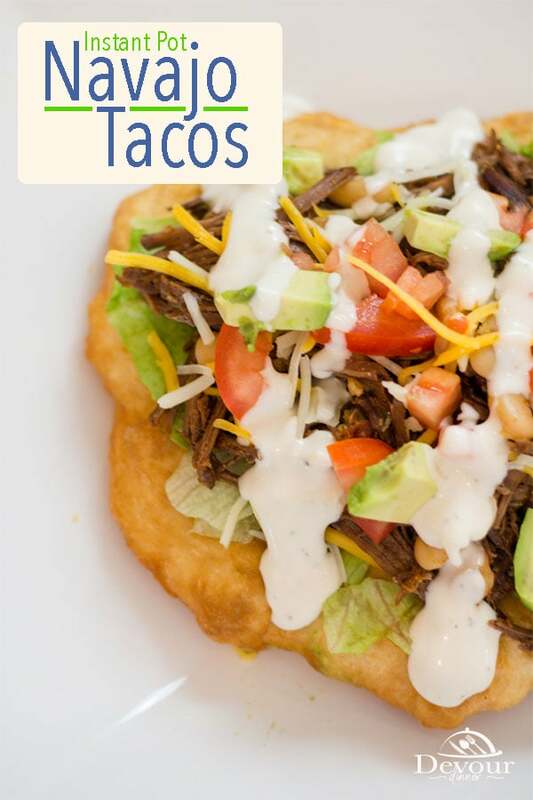 Navajo Tacos are made with Indian Fry Bread, a simple recipe using flour and water that has stood the test of time. 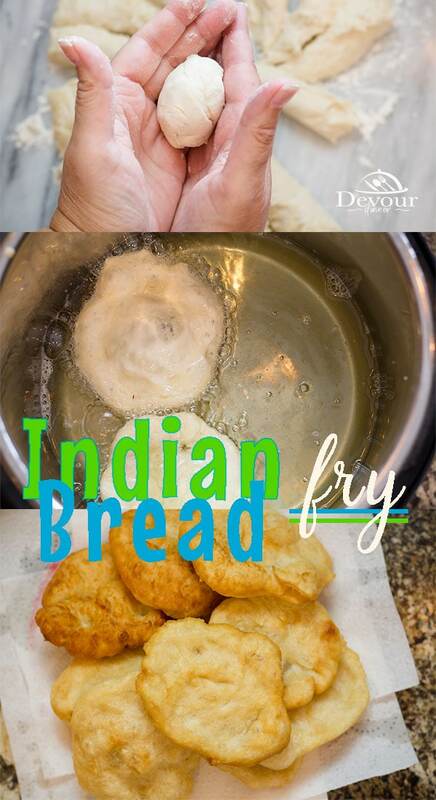 This fry bread is delicious and crispy on the outside and a soft tender chewy on the inside. Oh it’s good! Making the mouthwatering meat for this Navajo Taco recipe is a pice of cake. But don’t take my word for it. Give it a try yourself. Really, I promise. I love my Instant Pot. I do! Meat comes out juicy and tender every time and this recipe is no exception. I use London Broil in this recipe because it’s just a great affordable cut of meat. 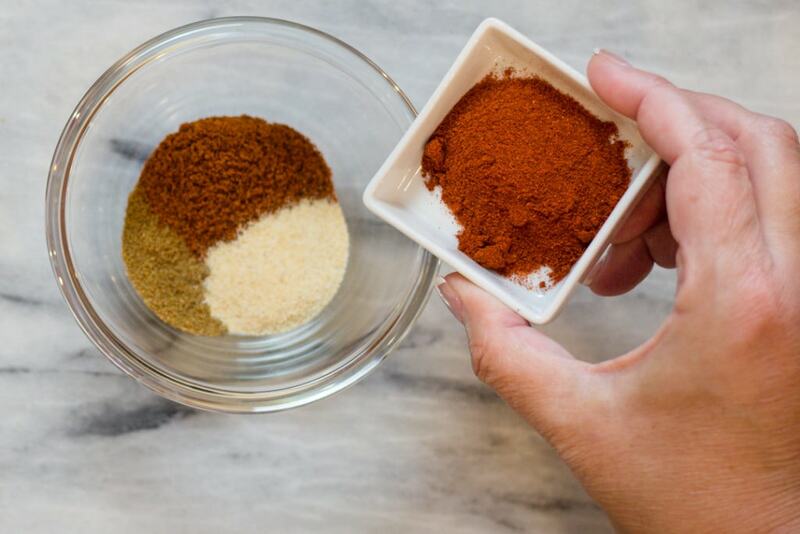 It pulls apart and holds the flavor of spices and seasonings well. Who Invented the Navajo Taco? It’s believed that the Navajo Taco was invented by the Navajo Tribe. But it seems that it’s hard to find a tribe that doesn’t lay claim to some sort of Fry Bread or the Indian Taco. Is there really a right or a wrong way to eat a Navajo Taco? I think not! 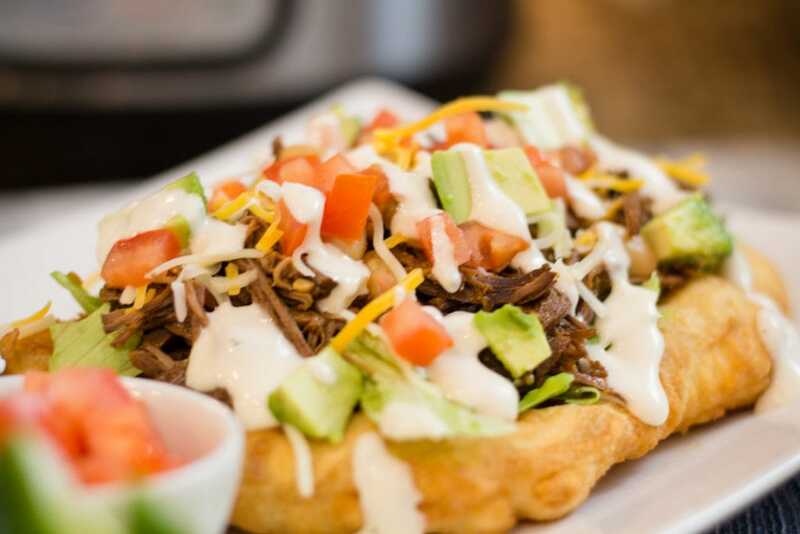 With Fry Bread on the bottom and loaded with tender meat and your favorite toppings, this Taco is best eaten with a fork and a knife! 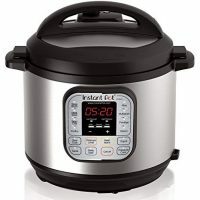 Instant Pot: This recipe really isn’t hard, it just takes some time. 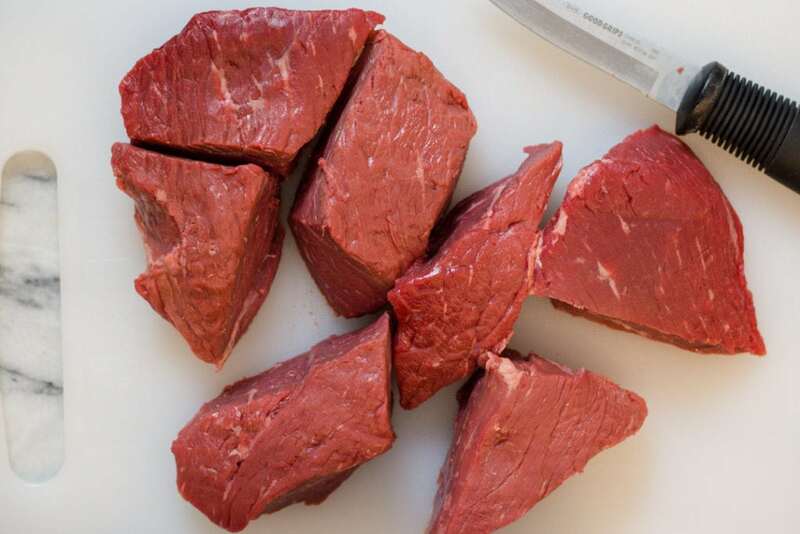 Cut up your meat into large chunks. About 4-5 good chunks. Add your seasonings and 1 cup beef broth to your Instant Pot and set for 60 mins Manual (Pressure Cook) high pressure. Allow a 30 minute Natural Release and quick release the remaining. Then shred with forks. Place back in reserve liquid to absorb all those yummy flavors before serving. Crock Pot: If you have all day, this mouthwatering tender Taco Meat can also be made in the Crock pot. 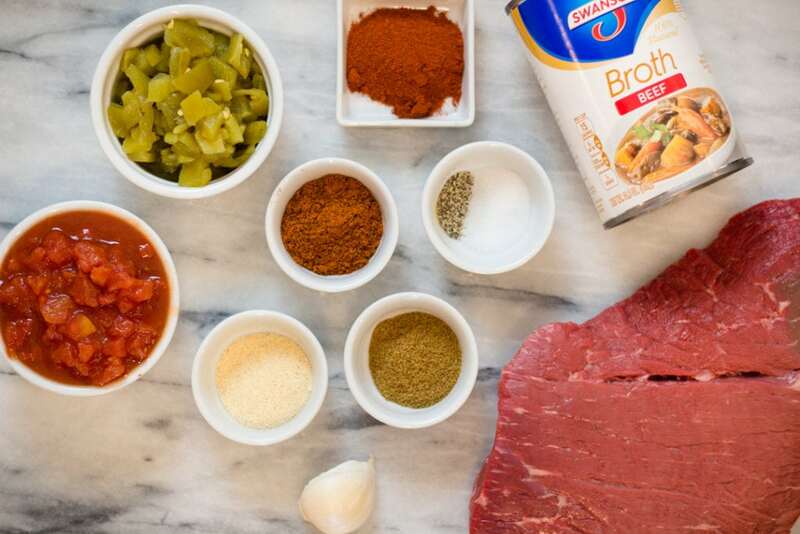 The directions are similar, however you do not need to cut up the London Broil into chunks first. 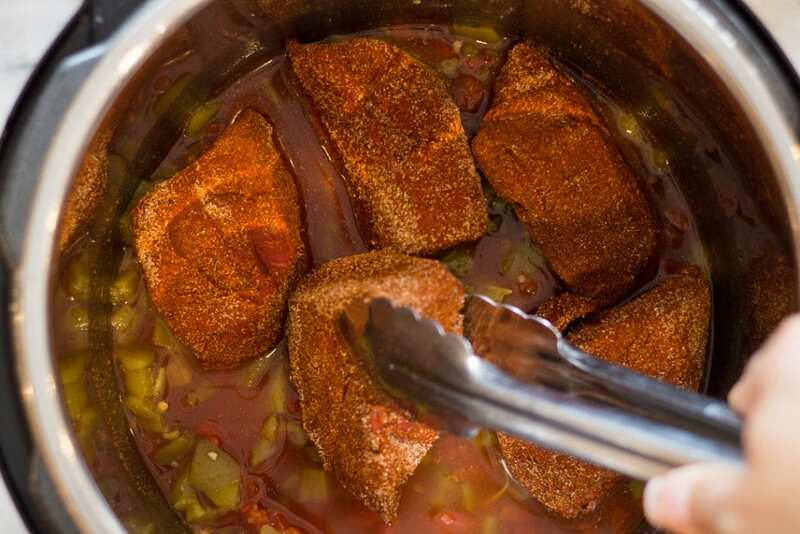 Place your meat into your crock pot, add seasonings and broth and cook on low for 6-8 hours. When done, shred with forks and return to liquid to absorb those yummy flavors. If your family is like mine, then having only one taco recipe just isn’t enough. We also enjoy Pork Street Tacos as they are so easy to make in the Instant Pot as well. Or a healthy option of Ground Turkey Tacos which can be made both in a tortilla shell or in a lettuce wrap. They are really good! 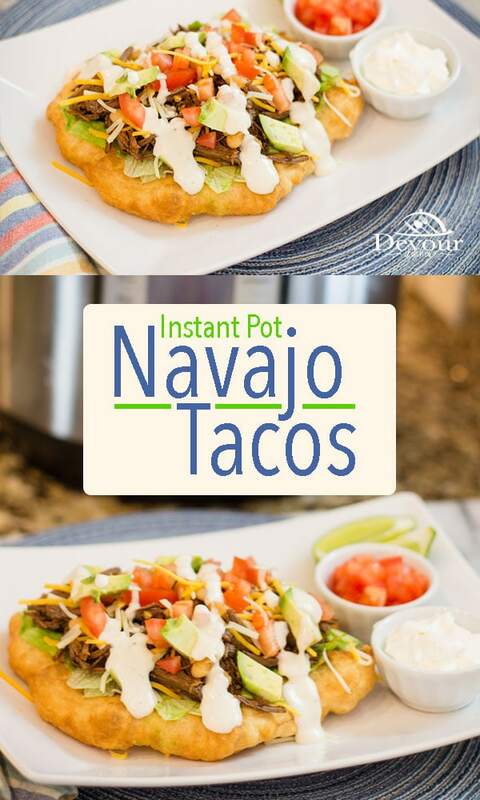 Don’t forget to PIN this Navajo Taco Recipe for Later. More Great Recipes to try, we promise they are delicious! In a gallon size Zip-loc bag combine Cumin, Chili Powder, Paprika, Onion Powder, Sugar, Salt, and Pepper. Place meat into Zip-loc back and shake to coat. Add Beef Broth, Diced Green Chilis, Crushed Garlic and Diced Tomatoes to Instant Pot and stir. 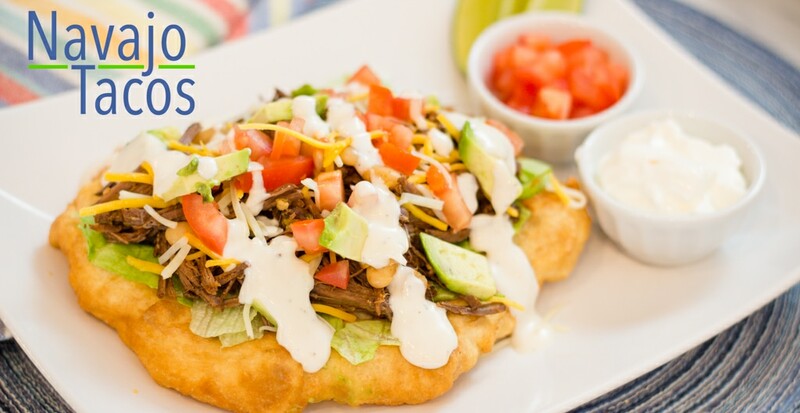 To Serve, drain meat and serve over Indian Fry Bread and top with Shredded Lettuce, Salsa, Sour Cream, Avocado, Cheese, Olives, beans, and anything else you wish to top your Navajo Taco with. Add Beef Broth, Diced Green Chilis, Crushed Garlic and Diced Tomatoes to Crock Pot and stir to combine. Set to Low for 6-8 Hours. Remove Beef from Crock Pot and shred with forks. Place back into liquid. 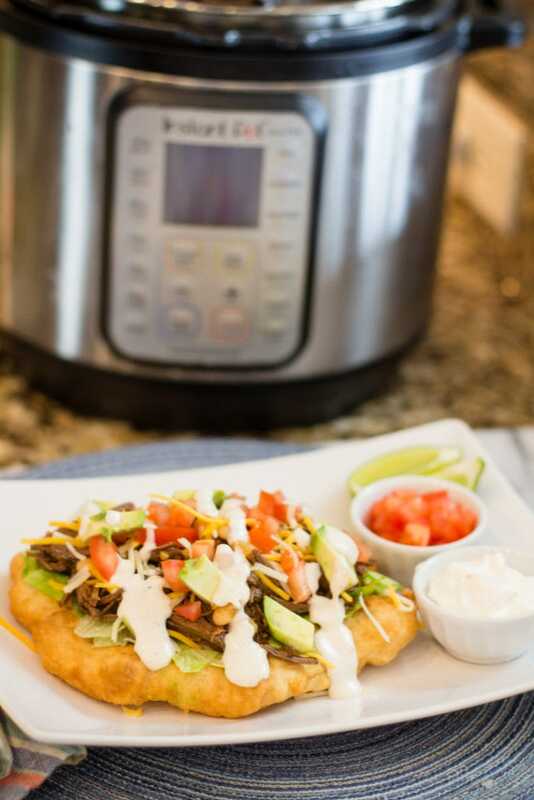 Make your Indian Fry Bread as the base of the Navajo Taco topped with all your favorites (chopped lettuce, diced tomatoes, sliced olives, sour cream, shredded cheese, avocado, etc. We also love to add Ranch Dressing on top too. Oh the combination is just delicious! Add hot water and stir with a spoon. You can also mix with your hands. Dough will be sticky. 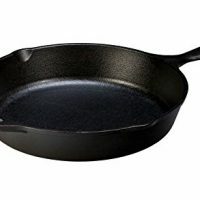 Heat oil in Fry Pan over medium/high heat OR Instant Pot on Saute until it reads "hot"
Add one piece of bread at a time in hot oil and allow to cook until golden brown and then flip. About a minute on each side *variable for how hot oil is heated. Remove from oil and allow to drain on paper towels. 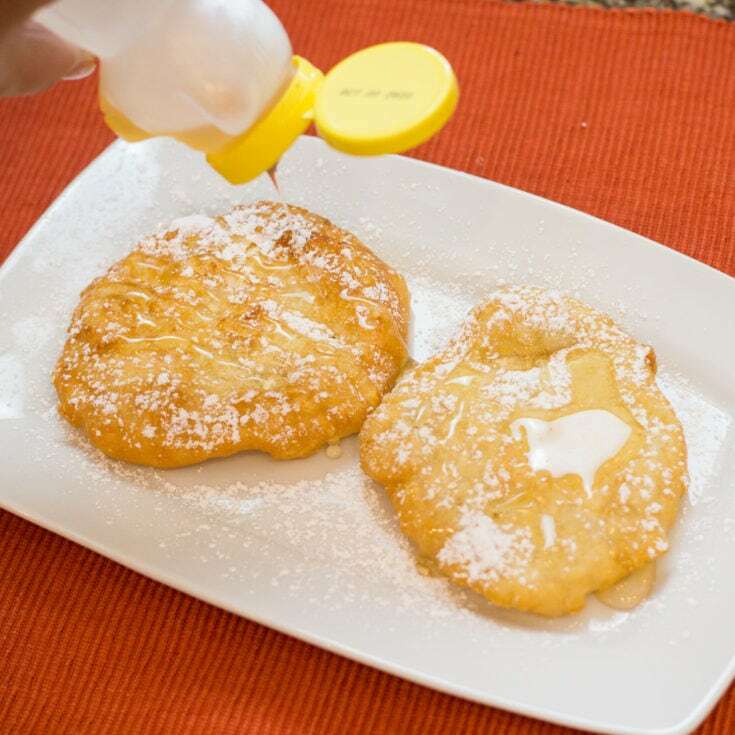 Indian Fry Bread is also known as Scones. Add Powdered Sugar, Honey, Fruit, Whipped Cream, Ice Cream, and more for your sweet dessert. 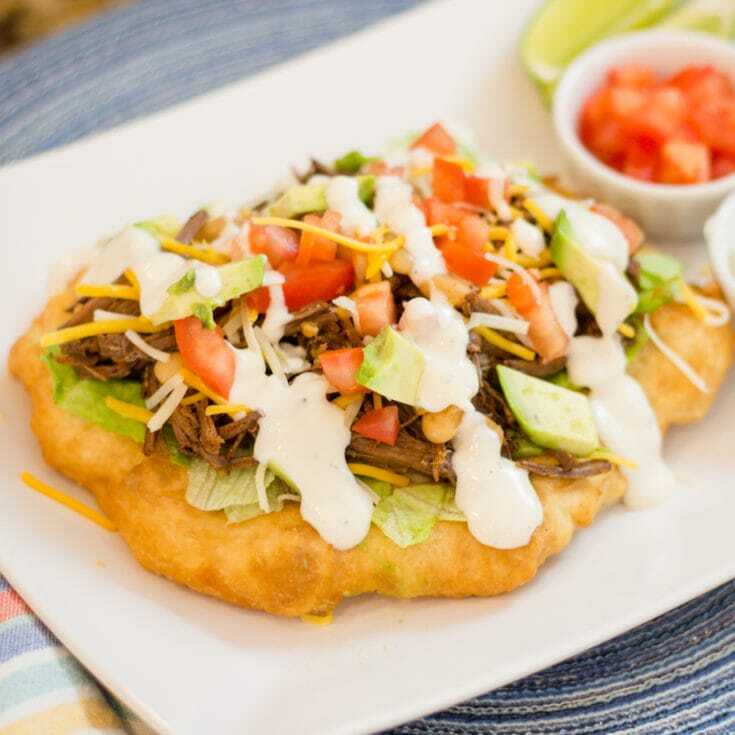 Make Navajo Tacos with Indian Fry Bread. Add Taco Meat, lettuce, tomato, avocado, cheese, and sour cream.